This should be pretty obvious and it's been 7 years since this series started but I'll spell it out anyway: Although I try pretty hard to avoid spoilers in my reviews, there will be spoilers for the previous books. So if you're like me and lived under a rock for the last 7 years, start with the first one. Valentine has been defeated, Jocelyn (Clary's mom) is awake and engaged to Luke, Clary is home in NY and free to love her not brother Jace. Jace has been training Clary to be a Shadowhunter, as well as being the perfect boyfriend. 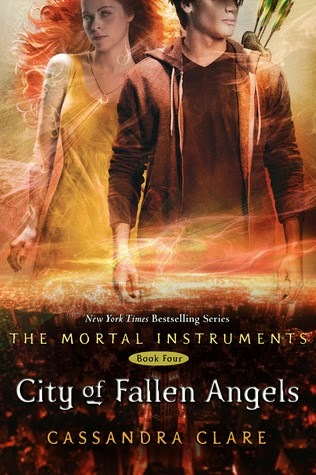 Everything should be peachy keen, but after a few short months yet another obstacle is thrown in Clary and Jace's way. Someone is killing Downworlders and Shadowhunters and when Jace starts having dreams about killing Clary, he reacts by distancing himself from her. There's also some stuff about Simon not being happy as a vampire.